Henk Kroes has been chairman of the world famous Frisian Eleven Cities 200 km Skating Tour. To organise this tour a reliable track is absolutely necessary and this means that we need to have a very cold winter. Statistics show that climate change causes significantly lower chances for having a tour. It also influences daily winter life for his grandchildren. My name is Henk Kroes and I am 69 years old. The small town I live in, Boazum, has only 400 inhabitants and is situated in Fryslân, a province in the northern part of The Netherlands. From 1970 until 1994 I have been the so-called Ice Master of the world famous Eleven Cities Tour (Elfstedentocht) in Fryslân, The Netherlands. From 1994 until 2008 I was the chairman of the organisation committee. Being the Ice Master means that you have to decide whether or not the Tour can be organised which is quite a responsible task as you will see. The Eleven City Tour (Elfstedentocht) is a traditional speed and endurance contest for speed skating. The participants, some 300 race competitors and some 16,000 tour skaters, must skate over 200 km in one day. When doing this they will visit all eleven historic cities of Fryslân. Because ice conditions must be strong enough to enable such a number of people to be on the ice without risks, this major event is not held every year. A minimum thickness of 15 cm strong ice is needed! So when we have a severe winter, everyone in Fryslân is very anxious to know: will this be a year with a Tour?? This does put substantial pressure on the Ice Master, I can tell you! We keep records about weather conditions in relation to the ice conditions. Organising the Tour is not something that can be done easy: we need thousands of volunteers to help us. So we have a scientific approach combined with a long list of skilled advisors to say yes or no. As we say in Dutch: we do not skate in one-night’s ice. Since the first official race in 1909, only 15 times the conditions were good enough and I myself was so lucky to say ‘it giet oan’ (“it ’s on”) three times myself. As I see it, nowadays we have less severe winters. 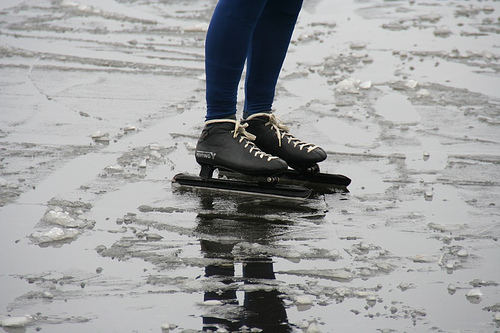 The last Tour was in 1997 and since then I am lucky to have grandchildren, but there has not been an “average Dutch winter” with skating outdoors on our lakes and canals. 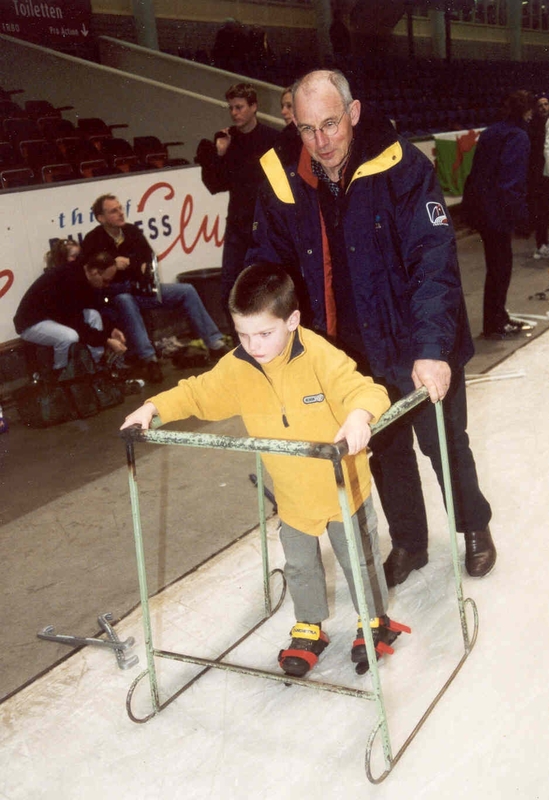 Children in Fryslân used to learn skating behind a chair, just being put on the ice by their fathers, like I did myself. Since 1997 I did only a small tour in the surroundings of Boazum, and it was one day only that the ice was alright for doing so. My grandchildren have to skate indoors, on Thialf, Heerenveen. But that’s quite different. The end of a great Fryslân tradition? The small town I live in, Boazum, is close to the ‘track’ of the Tour. Will we again see thousands coming through the bend in the small canal where the picture is taken? Many people in Fryslân believe we will not experience the Tour again because of global warming. Personally I think that we will see an Eleven Cities Tour again, because cold winters will be there always, from time to time. But statistics show that we will see more warm winters so I believe the frequency will definitely be lower. People from the IPCC indicate that, if the average temperature will rise with over 5 degrees by the year 2100, the chances for a Tour will be close to zero. And this worries me very much. Not only because of the lost tradition of the Tour itself, but also because of the impact on the Fryslân traditions I value so much. It is about living with nature, living with water, living with ice in winter. Not to mention social aspects: when there is ice the people of Boazum come together for fun, for primary school skating contests, for short distance races, for drinking hot chocolate together. So for the sake of the Tour and the Frysian tradition of living with ice in winter, I strongly urge everyone to act. It is not too late yet! Western Europe generally has a maritime climate with mild winters and summers, influenced by the western winds over the ocean. Only when the continental and northern inlands regions are cold and an eastern wind blows, the proper conditions arise for this ice skating race. These conditions will most likely also occur in the future, but less frequent. Over the last 20 years the average winter temperature in The Netherlands was 3.4oC, which is 0.9oC higher that the long term average. This increase is mainly due to the increasing dominance of western winds. There is a strong relation between winter temperature and the thickness of ice. Per oC the average thinness declines with 5 cm. From this coarse relationship, the frequency of future tours can be estimated on basis of the IPCC climate-change scenarios. With a temperature increase of 2oC, only ten races can be organized (compared with 15 in the 20th century), with an increase of 4oC only 5 races and above 6oC only one race. Brandsma, T. 2001. How many Eleven cities tours in the 21st century? that projected how many skating races could occur in the 21st century. Henk Kroes teaches his son to ice skate.